MAGNESOL® is a safe, pure white compound that removes both solid and dissolved impurities from used oil to provide extended oil life. Your oil stays clear and clean so that you can provide the customer with consistent, crisp and golden delicious fried foods. 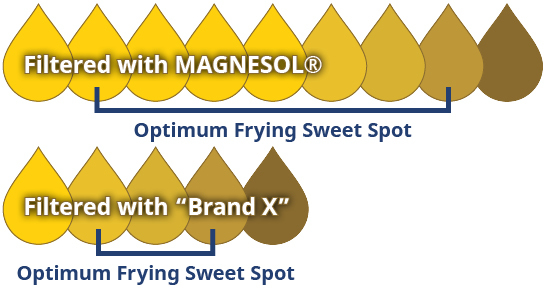 MAGNESOL® meets the food grade specifications of the FDA, NSF, JECFA of WHO. Improve oil life up to 50%. Sample analysis results using 3 50lb fryers at 1 location. Fryers used 7 days/week, with 4 days of frying days between oil changes. Get a complete savings analysis for your operations.